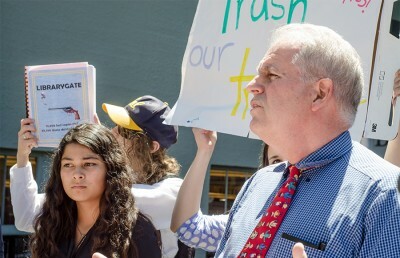 Community members, including several former librarians, rallied Tuesday to protest book-weeding practices at the Berkeley Public Library and encourage participation at upcoming city Board of Library Trustees meetings. Repeated demonstrations have occurred since July over library director Jeff Scott’s handling of the book-weeding process. The library has been removing items that were damaged or had especially poor circulation. 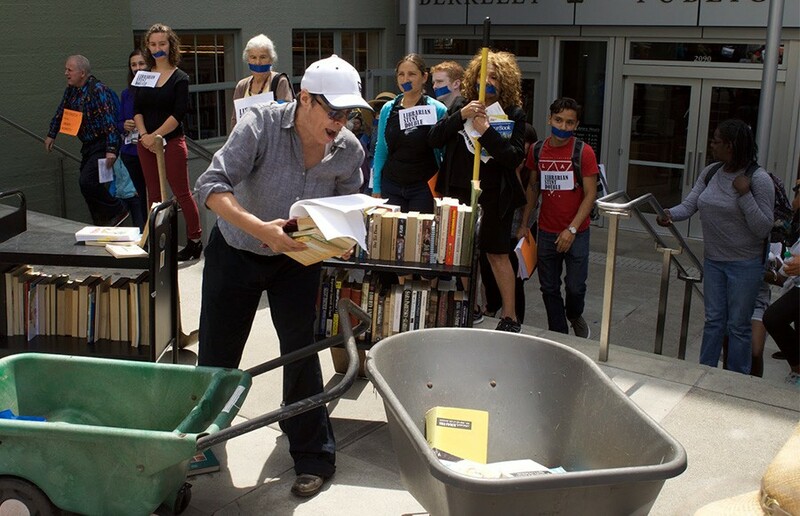 The event featured a satirical reenactment of the book removal by comedian Marga Gomez, who impersonated the library director and tossed books into wheelbarrows while “librarian stunt doubles,” representing dissenting employees, came forward one by one to voice their opposition. 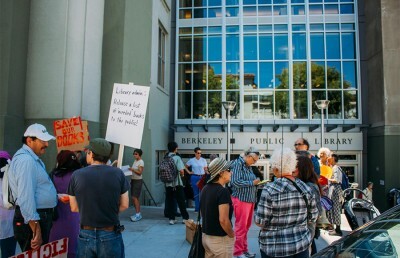 The protest was organized by Save the BPL Books and was its third rally in three weeks. Scott did not respond to request for comment before presstime. Participants said one of their goals was to raise awareness of upcoming meetings of the Board of Library Trustees, one of which will include a performance review of Scott, who became director of the library in November, and a chance for public comment beforehand. According to former Berkeley City Councilmember Ying Lee, the “primary responsibility” mainly rests on the trustees. She added that many community members have approached the trustees and the council, and felt “disappointed” that action was not taken. In previous reports from the library, Scott said about 2,200 books had been weeded, but in a press release last week, he said the number was based on a misinterpretation of the library databases. According to Scott, weeded books were being deleted from the system, not marked as “withdrawn,” as was previously thought. His latest estimate last week counted 40,820 titles removed since January. According to outside inquiries into the library databases last week, 39,440 items had been removed from the system, which sparked another protest Aug. 12. 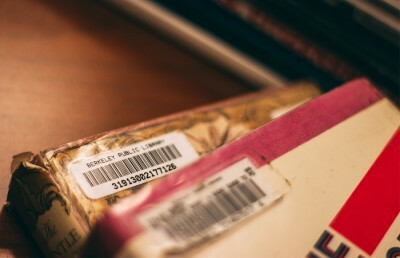 “You can’t have an evaluation without a factual understanding of what’s going on and what happened,” said Peter Warfield, founder and executive director of the Library Users Organization, citing confusion over the number of books removed. 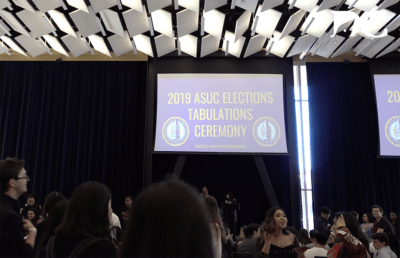 Zaynab AbdulQadir, ASUC community development manager, represented the ASUC at the rally and expressed the organization’s solidarity with the protesters. Save the BPL Books organizers and City Councilmember Kriss Worthington spoke of the alleged intimidation of librarians who wanted to share their opinions on the book-weeding process. “I’ve heard personally from many staff members — not all staff members, but many staff members — who continue to be fearful about possible repercussions or consequences if they speak out,” said Andrea Mullarkey, a teen librarian at the library’s south branch and shop steward for Service Employees International Union. Worthington said his No. 1 request was that the Board of Library Trustees conduct an independent investigation into the issue. A special performance evaluation meeting of the Board of Library Trustees will occur Aug. 26. A regularly scheduled board meeting will occur Sept. 9. “There is a staff group that continues to want to work constructively with library administration to ensure that we have the best possible collection for our diverse patrons,” Mullarkey said.